In preparation for the new academic year, I have been searching for ways to informally assess learning. 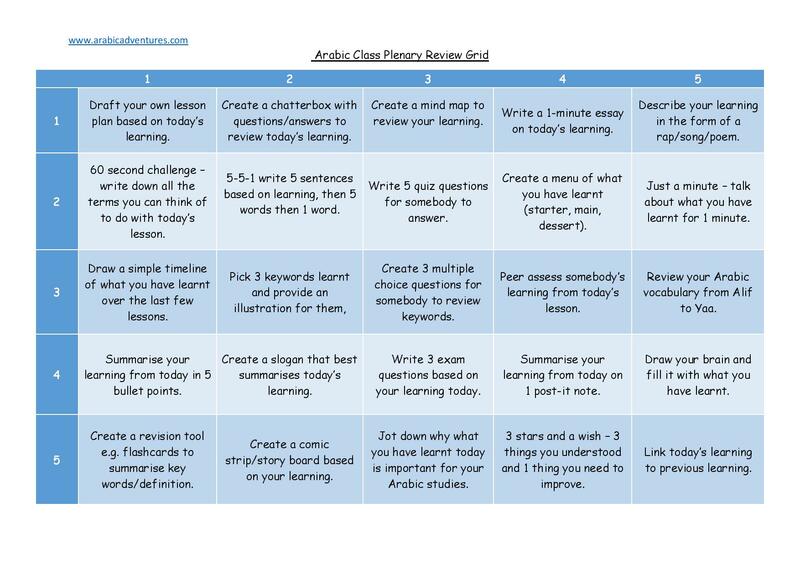 An easy way to do this is to make sure that time is taken out to complete the plenary at the end of each lessons. As I teach teenage muslim girls, I think they would appreciate being given the chance to choose how they want to sum up or reflect on their learning at the end of a lesson. So here’s my version of something I found on Pinterest (the creator has allowed teachers to edit the resource to make it their own). So here is my version which is suited to my teaching needs. Insha Allah, now that I have spent time creating a resource for plenaries, I will be motivated to use it with my students. This entry was posted in General and tagged arabic class plenaries, Arabic Language, Arabic language resources, arabic plenary ideas. Bookmark the permalink.